Hans-Ulrich Rudel pulls his Junkers Ju-87B Stuka out of a dive after bombing the Soviet battleship Marat on September 23, 1941. Until very recently the remote forward airstrip had been deep inside Soviet Russia, but now it was Nazi territory. Lieutenant Hans-Ulrich Rudel and the rest of his dive bomber wing had gathered in mid-September 1941 to strike another blow in Operation Barbarossa, Germany’s campaign to conquer the USSR. Out in the Gulf of Finland, the Soviet Baltic Fleet’s 23,000-ton dreadnought Marat was hurling 12-inch, 1,000-pound shells 18 miles onto German forces encircling Leningrad. The men of Sturzkampfgeschwader 2 (StG.2), flying Junkers Ju-87B Stukas, had been tasked with sinking the troublesome ship. It would be nothing like raining bombs and fear over fleeing enemy infantry and civilians, as Stukas had across Spain, Poland, Belgium and France. And Rudel had flown his first combat mission just three months earlier. He spent the Polish invasion as a backseat observer in reconnaissance planes, and sat out the Battle of Britain and the Balkan and Cretan campaigns. Not until the invasion of Russia was he at last given a combat seat. With near-complete air superiority on its side, the Stuka was back in its element—relentless blitzkrieg. They had pulled out a dozen feet or so above the water. Behind them Rudel saw a 1,200-foot pillar of smoke and fire billowing from the battleship. His bomb had exploded in an ammunition magazine. Marat’s bow had blown off. The Stukas regrouped at their field for a go at the cruiser Kirov. Taxiing for takeoff, Steen’s plane mired in soft ground, so he switched to Rudel’s Stuka. Rudel had to watch as the CO took off, with Scharnowski still in back. In the midst of their attack dive, they took a hit in the tail. Unable to pull out, Steen aimed the Stuka at Kirov, but hit the sea alongside. Sunk in shallow water, Marat was refloated in a few months and used as a stationary gun battery. After 16 months the encirclement of Leningrad was broken. By that time Adolf Hitler had other goals: Ukrainian wheat. Caspian oil. Stalingrad. Meanwhile Rudel—now a 500-mission veteran—survived his first Russian winter and a summer commanding a Stuka training unit. He also married his fiancée, Ursula. By the time he rejoined StG.2, flying the new Ju-87D over Stalingrad, the German Sixth Army had already cornered the Russians in 1,000 yards of the Volga River’s west bank. 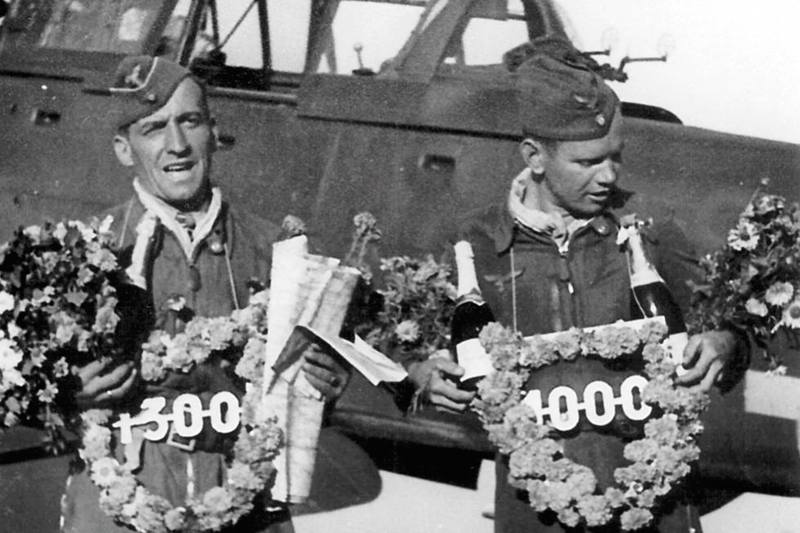 In February 1943, Rudel flew his 1,000th mission, for which the wing gave him a chimney sweep and a pig (both lucky) and an honor goblet (full of milk). He was then invited to Rechlin, Germany, to help test a new concept in anti-tank warfare. It had occurred to the German high command that the most efficient way to kill a tank wasn’t by trying to hit it on the roof with a bomb. Armed with two 600-pound cannon pods, the Stuka became slow and unwieldy, unable to dive or carry bombs, but its 6-foot gun barrels could put 37mm tungsten-core shells through square-foot targets from the air at more than 150 yards. This Ju-87G—the Kanonenvogel (Cannonbird) or Panzerknacker (Tankcracker)—would become one of the war’s supreme tank busters, largely in Rudel’s hands. Rudel got off to a bad start, shot down by flak on his first combat test, but he made short work of Russian landing craft on the Kuban front. Promoted to captain and awarded the Oak Leaves to his Knight’s Cross by Hitler himself, he agreed to take a Panzerknacker back to the front, just in time for the epic July 1943 Battle of Kursk. Soon appointed wing commander, Rudel formed an elite tank-hunter squadron, a Stuka “fire brigade” tossed into the line wherever the latest Russian breakthrough threatened. His mission tally and score rose dramatically; by November he had racked up 1,500 missions and more than 100 tank kills. His back-seater, Sergeant Erwin Hentschel, became the most successful gunner in the Luftwaffe, with more than 1,200 missions and several enemy aircraft to his credit. Rudel recommended him for the Knight’s Cross, but the paperwork had not gone through when he was called to Hitler’s Wolf’s Lair headquarters to receive the Swords to his own Knight’s Cross. Rudel took Hentschel along with him, and by sheer force of personality arranged for the gunner to receive his medal directly from the Führer. Yet the Stukas were unable to halt the relentless Soviet offensives leading into the winter of 1943. Terrible weather shielded the enemy from aerial attack. On one reconnaissance mission, lost in thick fog and running low on fuel, Rudel felt his way down to a forced landing. Hentschel scouted a nearby road jammed with German truck traffic. “We taxi along the very broad highway as if we were driving a car,” Rudel recounted, “obeying the usual traffic regulations and allowing heavy lorries to pass….Many of them think they are seeing a ghost plane.” Nearly 25 miles along, surely some sort of taxi record, an overpass blocked the way. Leaving Hentschel to guard the plane, Rudel caught a ride to base and returned to take off when the weather lifted. He also proved the Panzerknacker was effective against Soviet “flying tanks.” Catching a flight of Soviet fighters and Lend-Lease Bell P-39 Airacobras escorting heavily armored Ilyushin Il-2 Shturmoviks to battle, he dropped down alone through the fighter cover. “When I have got to within three hundred feet of [the Shturmoviks] I…loose off a round of anti-tank ammunition from each of my slow-firing cannons.” The infamous Il-2 was no better armored than a T-34 against cannon fire from above. Rudel’s target exploded; he escaped. In late March 1944, StG.2 (which had been redesignated SG—Schlachtgeschwader, or battle wing—a Luftwaffe admission that the Stuka’s glory days as a dive bomber were over) joined the effort to cut the Soviet bridgeheads over the Dniester River near Nikolayev, Ukraine. On his eighth sortie that day, now-Major Rudel saw one of his crews forced down on the wrong side of the river and landed to pick them up. (He had performed such rescues a half-dozen times before, and had been so rescued himself.) But with two extra passengers, his Stuka bogged down in the mud. With Soviet troops closing in, Rudel, Hentschel and the rest ran several miles in full gear. Doffing flight suits and boots, they slid down riverbank cliffs into the water. The 600-yard-wide Dniester was in full flood, a few degrees above freezing and full of ice. “Gradually one becomes dead to all sensation save the instinct of self preservation,” Rudel recalled. His athletic training saved him: Last into the water, he was second to reach the far bank. Eighty yards short, gunner Hentschel threw up his arms and went under. Rudel dived back in, but couldn’t find his flying mate. The others were soon captured. Rudel had been shot in the shoulder, and was wet, barefoot and freezing. Although deep in enemy territory, he refused to be taken prisoner. Soviet dictator Josef Stalin had announced a 100,000-ruble reward for the capture of the “Eagle of the Eastern Front,” dead or alive. Rudel sheltered among refugees and locals who had no love for Stalinist Russians, and barely survived his trek across some 30 miles of enemy territory to reach German lines. His feet were so badly injured that when he next flew he had to be helped into his plane. Yet within the week Rudel chalked up his 1,800th mission, destroyed 17 enemy tanks in one day and went to Hitler’s Berghof retreat to receive the Diamonds to his Knight’s Cross, Germany’s highest decoration at the time. (The Führer permitted him to wear padded flight boots for the ceremony.) Reluctant to risk his hero again, Hitler grounded him, but relented when Rudel said he would refuse the medal if forbidden to fly. By then the Soviets’ new T-34/85 medium and JS (Josef Stalin) heavy tanks were banging on Nazi Germany’s gate, or grave. On February 8, with his leg still in a cast, Rudel shot up a dozen tanks that had breached the Oder River. He used his last cannon round to score an unlucky 13th, a Stalin, but his Stuka was hit by Soviet 40mm anti-aircraft fire. On the verge of passing out, he called back to Gadermann, “Ernst, my right leg is gone.” Gadermann (who would survive the war with 850 missions and earn his own Knight’s Cross) talked his half-conscious pilot down to a crash-landing, pulled him from the wreckage and stopped the bleeding. Rudel woke up in a hospital with his leg amputated below the knee. Recovering in a Berlin bunker, Rudel was back in a Stuka by Easter, flying one-legged against Hitler’s orders. (His subsequent tank kills were attributed to the squadron anonymously.) The Führer wanted him to take over a jet unit, but now even Rudel saw the cause was hopeless. By April 26, it was barely possible to fly into the embattled capital. Rudel phoned Hitler’s adjutant, Colonel Nicolaus von Below, offering to land a Stuka on a Berlin road the following morning, and implying he could evacuate the Führer. Hitler refused, and within the week was dead. Still fighting for Schörner’s Army Group Center in Austria, on its surrender SG.2 was ordered to hand over all equipment to the Soviets. Though Rudel would have preferred to lead his wing on a glorious suicide mission against a Soviet headquarters, instead he sent his men to flee overland, west toward the American lines, on May 8. He and a half-dozen other pilots deliberately crash-landed their planes on an American-held airfield and surrendered. In all, Hans-Ulrich Rudel was credited with 2,530 missions, one battleship, one cruiser, a destroyer, 70 landing craft, some 800 vehicles, 150 gun positions, numerous armored trains and bridges, 519 tanks and nine aircraft. He had been shot down more than 30 times (never by an enemy pilot) and wounded five times. Frequent contributor Don Hollway recommends for further reading: Stuka Pilot, by Hans-Ulrich Rudel; Stuka Pilot Hans-Ulrich Rudel, by Günther Just; Junkers Ju 87 Stuka, by Manfred Griehl; and Ju 87 Stuka in Action, by Brian Filley. Are you ready to build your own copy of Rudel’s Tank-killing Stuka? This feature originally appeared in the July 2011 issue of Aviation History. Subscribe today!